The paddle surfing or Stand Up Paddle (SUP) is a sport where it’s about rowing on a floating surfboard. It is the fashionable activity in our beaches due to its simplicity and accessibility. Although it is recently popularized, it is a very ancient practice that was already used by Polynesian civilizations to move around the Pacific islands and atolls. Stand Up Paddle Surfing (SUP) allows you to enjoy nature, the sea and the coast while practising a very beneficial physical exercise. It develops the sense of balance and reflexes. Without realizing you will notice how different body muscles work from both the upper and lower trunk. 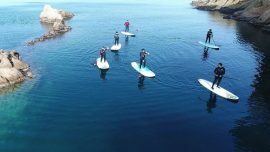 It is one of the best ways to enjoy the Costa Brava coast since only the Stand Up Paddle Surf (SUP), thanks to its position, offers us the feeling of walking through the water. You can discover all Costa Brava corners from a different perspective. It’s a very nice feeling! The Paddle Surfing is a suitable sport for all ages and you do not have to have a great physical shape or previous experience for practice it. How to practice Paddle Surfing on the Costa Brava? 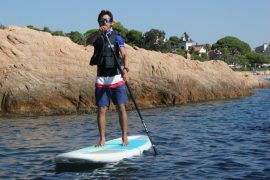 – We have tours and routes Paddle Surf Costa Brava (SUP) where we will give you the basic explanations so that you can manoeuvre the paddle board easily. We will also provide you security explanations to safely enjoy paddle surfing. Once relevant explanations have been made, we will start a paddle surfing route to discover all the corners of Sant Pol – S’Agaró bay in the heart of the Costa Brava. We will visit small beaches and sea caves with incredible natural beauty and our monitors will show you all places and stories that are behind each corner. – We also offer private lessons for paddle surfing for those who do not have previous experience and want to start to learn this sport personally. It is also ideal for those who want to deepen the technique further. Our instructor will teach you how to row and manoeuvre with more efficiency so that you can cover more distance with less effort. – If you already have previous experience, you can also rent the Paddle Surf board and go for your own account. We have last generation paddle surf boards that we constantly renew. We are located in Sant Pol – S’Agaró bay, in the town of Sant Feliu de Guíxols, very close to Platja d’Aro. Do not think so, come and discover the Costa Brava paddle surfing e with us!